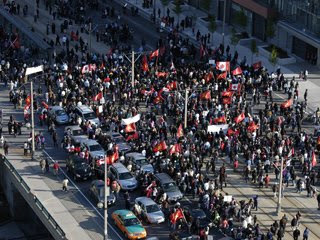 The protests staged by Tamil-Canadians in recent months took an unprecedented turn Sunday evening when hundreds of demonstrators spilled onto the Gardiner Expressway at Spadina Avenue, blocking traffic in both directions. This latest move was not pre-planned and appears to have been sparked by the community's anger over reports of 378 civilians killed in Sri Lanka Saturday night. In fact, protesters say the numbers are grossly underestimated and claim the total is closer to 3,000. A massive police contingent including the OPP was called in to contain the crowd and although there are no reports of anyone hurt yet, there is word the crowd is volatile and at least one person is under arrest. Traffic is backed up for kilometres, with officers diverting traffic as far west as Park Lawn. Police say the Gardiner will likely remain closed throughout the evening and are asking motorists to take alternate routes. Mayor David Miller is calling for calm and for Tamil demonstrators to peacefully move to a safer location. "Toronto's Tamil community is understandably concerned about what is happening to friends and family in Sri Lanka," he said in a statement. "They have an absolute right to make those concerns known and to protest. 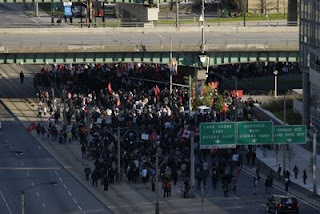 Endangering public safety by occupying the Gardiner or other public highways is not the right way to make that statement. "Like all Torontonians, I want to see a peaceful end to the conflict in Sri Lanka and hope members of the international community, including the Federal Parliament, will use their influence to see that humanitarian aid flows to the affected area." There are reports a second group of Tamil-Canadians have blocked the intersection of College Street and University Avenue not far from the stretch in front of the U.S. Consulate they occupied for several days more than a week ago. Sunday's protest began earlier in the day at Queen's Park, where Gunabalasuntharam Veerakathipillai is also on his eighth day of a hunger strike. He and his supporters say they are frustrated by the lack of response from the international community and want government officials in Canada and the U.S. to step in and put an end to the violence thousands of kilometres away. தற்போது நள்ளிரவு 12.00 மணியோடு -5000 மக்கள்- முற்றுகையிட்ட நெடுஞ்சாலையை விட்டு வெளியேறுகின்றார்கள். எதிர்க்கட்சியினராயுள்ள லிபரல் கட்சித்தலைமை, இலங்கை அரசுக்கெதிரான பொருளாதார மற்றும் பிற உதவிகளுக்கான தடைகளைக் கொண்டுவருவதற்கான motion ஜ பரிசீலிப்பதற்காய் உறுதிகொடுத்துள்ளதாகத் தெரிவிக்கப்படுகின்றது.